1. Heat the oil in a large frying pan and fry the chicken and beans for 4-5 minutes. 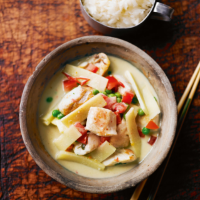 Add the Thai curry sauce with the coconut cream and bamboo shoots. Cover and simmer for 5 minutes. 2. Add the peas and tomatoes and cook for a further 5 minutes until the chicken is cooked throughout with no pink meat. 3. Meanwhile, cook the rice according to the pack instructions and serve with the curry.